We are happy to develop and organize any type of private, group, or corporate event—whether it’s an intimate wine and cheese dinner for a dozen people at The Tasting Table or an intensive week of home-cooking and culinary immersion for a group of foodies. 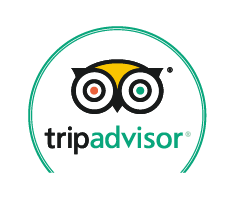 All of our signature tours can be booked for private groups, and we can also create customized tours and special offers for groups. Let us know what you have in mind, and we will do our best to help make it happen! The Tasting Table is a unique space with its own signature style—perfect for private wine-fuelled events which will make an impression. 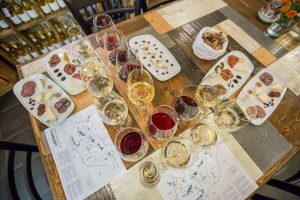 The Tasting Table is available for private events such as dinners, meetings, wine tastings, food and wine educational events, team-building, cocktail parties, and holiday parties. We can organize anything from an introductory Hungarian wine tasting or a Tokaji aszú tasting, to a team-building activity (such as a Bull’s Blood blending competition) or a five-course private dinner prepared by our chef. The 50-square-meter room can accommodate 32 guests for seated events, or approximately 50 for standing events. For smaller groups, we have a private cellar which seats 8 guests. We will work with you to plan the perfect event customized for your group. There is no room charge associated with reservations if the party meets a minimum number of participants. Contact us for a customized price proposal. 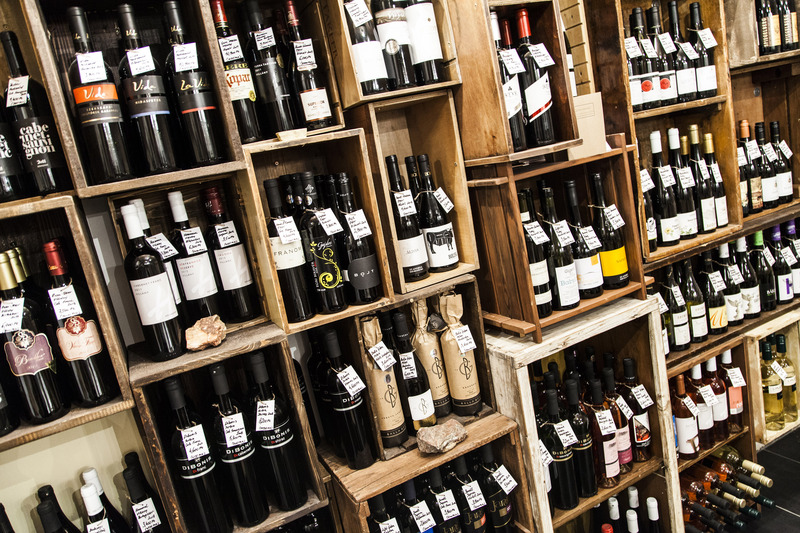 We are proud of our selection of unique Hungarian and Central European wines, from which we are able to put together a wide range of wine tasting themes, which can be casual cocktail-style events or sit-down tastings. Our tastings, guided by our sommeliers, are fun, interactive, and informative. 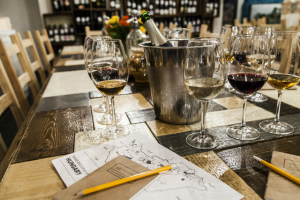 Our signature wine tasting is a crash course on the increasingly fabulous wines of Hungary, and is a perfect place to start your exploration of Hungarian wine culture. The carefully curated selection will tell the story of the wide range of Hungarian wine with a good overview of the history, major regions, varietals, characteristics, wine styles, and trends. Tokaj was the world’s first delimited wine region, and some of the world’s finest dessert wines are produced in this little corner of Hungary. Though the region is famous for its well-balanced dessert wines which are made in many levels of sweetness, stunning dry wines (especially furmint) are also produced here. This tasting will include a mixture of dry and sweet wines. We are pretty sure that by the end of the tasting, you will want to visit this very special region for yourself. Furmint is the work-horse grape in the Tokaj region, the star of Tokaji aszú, and the pride of Hungarian grape varietals. It is also a very versatile grape, and this tasting will feature furmint in a variety of styles (from a few different regions), ranging from sparkling to bone dry to very sweet. Hungary does not get much outside recognition for its rosé wines, but its winemakers quietly produce wonderful rosé, with refreshing acidity. During this tasting we will start with a sparkling rosé or two, and then taste rosés made from different varietals in different regions. Hungarian sparkling wine is underrated, despite many of them being great in value and quality. This tasting will feature Hungary’s top sparklers, all produced with the traditional method. Who needs merlot or chardonnay when Hungary has nearly 100 native grape varietals to get to know! Some are widely planted and others are found in just a few pockets of the country. This tasting includes the most promising and unique ones. Cabernet Franc is a complex varietal which does extraordinarily well in southern Hungary, especially Villány and Szekszárd. During this tasting we’ll taste some fabulous single varietals from these two regions, and we’ll see what happens when they are blended. How does the Hungarian winemaking scene compare to that of its neighbors? In this tasting we’ll taste Hungarian wines together with the same varietals from Austria, and see how they are similar and different. While Hungary is better-known for its whites, it is producing increasingly notable reds in many regions. This tasting includes reds from several regions in a variety of styles from Old World to New World. Understanding the many wine styles produced in Tokaj takes lots of learning (and tasting). This tasting will provide an overview of the complex and traditional process of creating Tokaj’s honey-hued wines. We’ll taste dry, late-harvest, szamorodni, and aszús with different levels of sweetness. 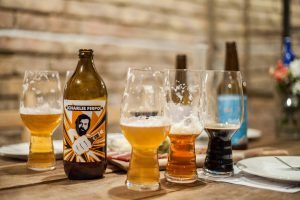 Other Tasting Themes could include focusing on individual regions in Hungary, horizontal and vertical tastings, blind tastings, as well as tasting wines from other Central European countries. The Tasting Table has a full-kitchen (and a fantastic chef) where we can prepare a variety of cold and hot food. We are happy to provide sample menus, or develop customized menus with wine pairings for your event. Our signature cold spread features an assortment of local cheese and charcuterie, fresh bread, and hand-crafted artisan oils (such as pumpkin seed, walnut, and poppy seed). We can add traditional foie gras and other accompaniments. We buy our products straight from the best small producers. We can offer several different menu choices for simple (one to two course) or more complex traditional Hungarian meals. Soups, stews, sausages, roasts…it all begs for the local wines which match the cuisine so perfectly. 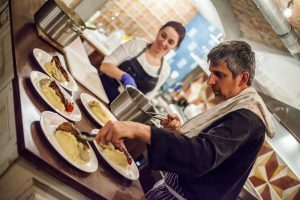 Our chef is passionate about experimenting with typical Hungarian flavors and ingredients, pairing them with new techniques or flavor combinations, and transforming them into dishes that are Hungarian, yet wholly contemporary. We work with a top cake designer and several bakeries. If your event requires a customized cake or other dessert, we’d be happy to arrange one. Wine and food are great additions (as well as mood-enhancers) to team-building activities. These events are ideal for promoting mingling and interacting among participants. These activities could be done in conjunction with a dinner. Bull’s Blood from Eger and Szekszárd is an iconic Hungarian red blend. This wine interactive wine blending activity involves mixing different types of wine, each of which bring something desirable, to create the perfect combination. Guests can try their hand at the art of blending while getting to know each other and working together as a team. The event starts with an explanation of Bull’s Blood and an introduction (and tasting) to each varietal used in the blend. Each group then receives a portion of each wine, measuring equipment, and blending rules. At the end, one person from each team presents the finished product to the whole group. The sommelier judges which group produced the best blend. Why do wine professionals sniff and swirl? In this fun and hands-on introduction to the proper way to taste wine our sommelier guides participants in tasting techniques, helping them analyze what exactly they are smelling and tasting. 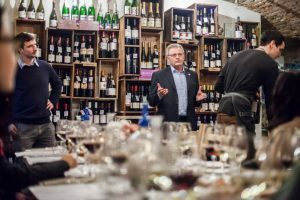 They will get hints on how to distinguish between different wines, characteristics, and regions, all while tasting some excellent Hungarian wines. Guests will be encouraged to discuss what they see, smell, and taste in each wine, and by the end of the event they will be able to confidently participate in a blind tasting with the rest of the group. Whether they are seasoned cooks or inexperienced ones, everyone joins together during this event to learn some traditional Hungarian recipes while preparing a feast for the group. The chef discusses the most important Hungarian dishes and techniques, while the group whips up the meal. Our sommelier is on hand, pouring different wines throughout the evening to keep the group energized while they cook. Afterwards, the group will sit down together to enjoy the fruit of their labor, along with a few perfectly paired wines. This event should be limited to no more than 15 participants. This event, which includes several games, pits teams against each other to see who can come up with the best answers. There will be trivia questions in different categories (including: Hungary, wine, food, and Hungarian food and wine), blind wine tastings, and more … of course with plenty of delicious wine flowing throughout the evening. Our venue is also ideal for more informal parties where the focus is on socializing with friends and colleagues. For groups of up to 50 people we can set up a cold buffet and an open wine bar. We are happy to arrange the food and wine for your event. But if you simply would like to rent the venue for a meeting or other type of gathering, we can also do that. Learn how to cook Hungarian style in our open kitchen. This upbeat event combines a casual cooking class with a dinner party, with wine flowing the whole time. You’ll start with an aperitif and nibbles of local artisan cheese and charcuterie, while our instructor explains the menu plan (a three-course meal) for the evening, and what needs to be done to get a delicious dinner on the table. As we progress with the cooking, through conversations with our chef instructor, you will learn about Hungarian culinary traditions, kitchen secrets, how the locals work with important local ingredients, and signature (and seasonal) Hungarian flavor combinations. We believe that wine and food are best enjoyed together, so our sommelier will pour samples of different wines throughout the course of the evening so you can taste and learn. The cooking can be hand-on for those who want to participate, while those more interested in observing and enjoying the wine can step back and watch. Once dinner is ready, we’ll sit down (with a well-deserved glass of wine) and enjoy the fruits of our labor together. Contact us for information and pricing. The Tasting Table can come to you! If you have a party too large for our space, or you would rather host a tasting event for your guests at your office or home, we are happy to bring our wine tasting experience to you. We can offer the above tasting themes at your venue, and can provide wine glasses and staff. Each of our off-site tasting events will be customizable for your specific needs and pricing is dependent on the wine served and the number of participants.